This is a very striking woodcut (edition 63 out of a limited run of 120) which in turn is an interpretation of a detail of a 15th century work by engraver Frans Hogenberg. The original engraving by Frans Hogenberg is pictured. July 22nd,1568 Dalen (the name was changed into "Rheindalen" centuries later because of postal reasons) is an autonomous town in the north of the duchy of Julich. In great Britain Elizabeth 1 rules for ten years. In the northern part of the Netherlands the freedom-fights have begun last year. So many of the Dutch people live as refugees in the duchy of Julich, which is neutral in this conflict. The Prince of Orania tries to rebuild a new army from these refugees. Suddenly the Duke of Alba appears with his army and beats the Dutch army at the 'Dalaner Heide' (Heath of Dalen) which is a neutral area. The only building which remained from those times is the transept of todays St.Helena-Church. 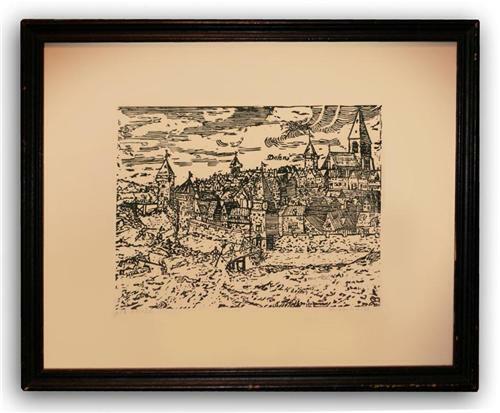 The woodengraving with the view of Rheindahalen is a detail fron a copper engraving, made from by Franz Hogenberg* in 1590. From this engraving nor more than 120 printings will be made. Every single printing are fuly handmade-so each of them is unique. *Franz Hogenberg 1535-1595. Frans Hogenberg, an engraver, worked and died in Cologne/Germany. He was a prolific copper engraver and etching artist of maps and town views. In cooperation with Georg Braun, a publisher, he created the first four volumes of the Civitates Orbis Terrarum in 1572.